Today’s post seems ripe for a good, bad, and unknown format! Considering Jelia’s character design, I thought she would be nearly impossible to pull off in pixel art, but this turned out to be a great depiction! Wait a minute, though… is still art what everyone wants to see? Wow, Jelia, just look at your hair go. ♥ And look at her ribbons fly up when she’s surprised! Those kinds of little touches bring the characters to life and add a lot of charm. =) Hope everyone else likes them as much as I do! I actually could have shown off the ones for Leaf last week if I had been thinking about it, by the way, but somehow it slipped my mind. 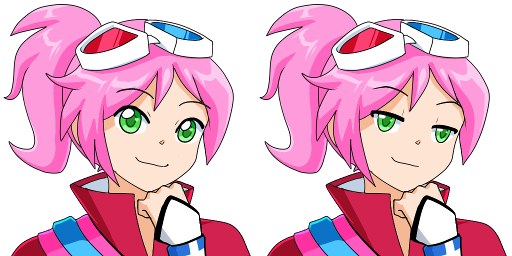 I might not have brought up these two portraits on their own, but Jig being involved reminded me to post a reminder on this weekly Monday blog to those of you not reading my Twitter to also check out the Dialogue page that’s updated weekly on Tuesday and gives glimpses into the cast’s personalities and a little bit of teasing about story and setting. Jig and Leaf were the most recent characters to showcase some lines! What else is good this week? The big tough situations from last week were finally resolved without a hitch as of Thursday. While everything turned out alright and actually at no monetary expense to me, make no mistake—this could easily have gone awry to the tune of $2500+ and another week of time (in addition to the phone calls, emails, scans, and so on that I did need to make). Boy oh boy, that’s a lot of good news this week. First of all, there’s no way I make my July goal for a playable demo at this point—I’ve come to terms with that. To be honest, it’s kind of liberating to say that because I’ve been feeling a lot of pressure to make an unrealistic goal and that won’t be a problem anymore. But why the change of heart? Well, two main reasons. For one thing, I severely underestimated the role of being a “project manager,” so to speak. Flora can be fast, Becca can be fast, Alex can be fast, and whoever the next pixel artists are could also be fast, but ultimately I’m still at the center being in touch with everybody while also trying and often failing to do what I need to do: designing, writing, and so on. If I could hire a programmer then it would be one thing, but when I’m taking on that role in addition to being a “manager,” there’s a lot of drain and getting sidetracked as many things all demand my attention. The other is software-oriented. 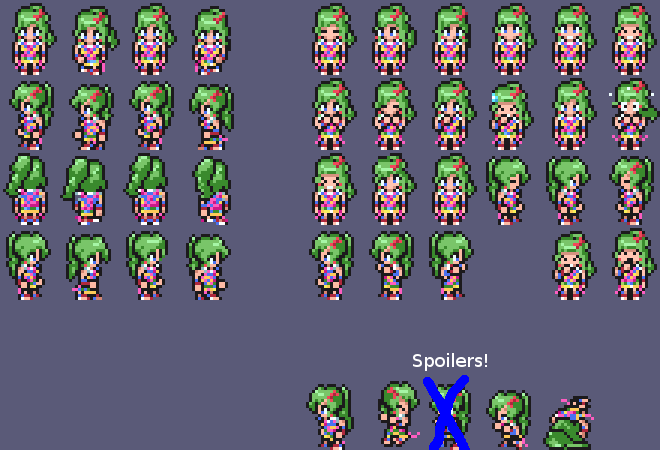 You may notice that I’ve shared animated sprites on a flat background instead of using Becca’s pixel art as background—or, better yet, showing actual footage of the game. That’s because getting graphics to do what I want them to do has been by far the most surprisingly difficult part of this entire game development venture. Like I said last week, some of my stuff more or less exploded when I upgraded to Unity 5. Just as a test I tried starting from scratch to see what happen, but even that threw challenges and brand new error messages at me. Now, theoretically nothing stops me from going to Kickstarter without a playable demo. I’ve backed dozens and dozens of projects that don’t have one—not only big-budget stuff like the latest Metroidvania, but even stuff like Sealark, which raised nearly $60,000 despite having nothing to show except pixel art, concepts, and one piece of music and came from (as far as I can tell) a previously unknown developer. …but I just can’t bring myself to do it. Am I dumb? Am I crazy? Should I just do it? To be honest, maybe. But right now I won’t. Which brings me to the second piece of bad news: I’m going to take that part-time job offer. Because of my indeterminate timeframe for so many things, even a slight boost to stability would be a huge boon and I’m hoping that the 20 hours won’t hit too hard. Of course I’m completely aware that I just said I’m already juggling too many different things, but I mean that in the light of trying to get everything together more quickly than is reasonable. If I relax a bit and give myself more leeway, that’s a different story. I’m now aiming for a demo this year, which is loads more realistic regardless of taking on a job or not. Do I want more dialogue portraits? Flora’s busy for the next couple months, so I don’t mean this would be coming immediately, but until now I’ve only commissioned portraits for characters who I would definitely need for the demo or thought I might need. With a longer time frame, there’s at least an option to do more. Probably the most notable reason to do it is for the sake of an entire humanoid species with an alien appearance that I haven’t shown off in the character designs yet because all of the notable characters wear the standard Imperial uniform. One of them in particular, Flute (named in tribute to Piccolo from Dragonball), is a mentor character to Sakura with a substantial role in the story. Do I want more pixel art? There’s already a little more coming, but I was going to hold off with additional tile sets like towns until after the demo. Again, I’m no longer constrained by that in a longer time frame. 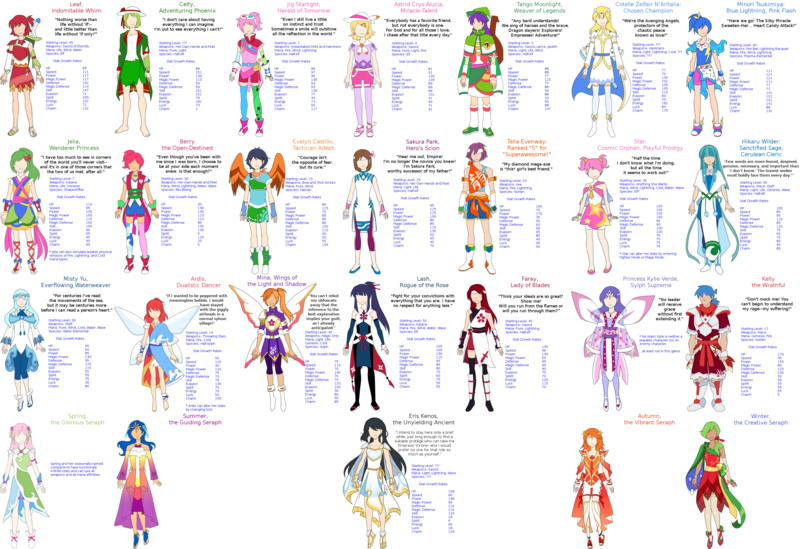 Believe it or not, there are actually still six characters where even their outfits aren’t designed yet (and one of those six is even a guy! )—and that’s without counting animals and fantasy creatures. Cotelle’s teaser line about the Avenging Angels refers to a group that’s missing more of its members than not right now. Want a teaser for one? A kickboxing elven cheerleader who has one pom-pom that, uh… let’s just say it’s not standard issue! So do I want more character designs? This probably seems like the most obvious thing ever, but much like I somehow didn’t think of posting animated sprites of Leaf last week until Alex suggested it, somehow I didn’t even consider a visual fashion system until a couple days ago. Should I do that since I’ll have a new source of money available to me soon? And if I do, then in pixel art or traditional art? Even amidst some bad news this week, I hope I’m ending this post by conveying open-ended questions that I’m facing right now. Like I said earlier, it’s liberating in a way—a more open destiny, if you will. This entry was posted in Devlogs, Dreamblazers on May 25, 2015 by JellyPaladin.